The Dwayne Johnson chest workout builds The Rock’s massive upper body. Johnson detailed his workout routine for the movie Pain & Gain via Twitter and Instagram. The Rock’s trainer, George Farah, also talked about the exercises they did together. The Rock’s chest workout is illustrated below. For Pain & Gain, Dwayne Johnson wanted to be bigger than ever. So, The Rock works his largest muscles 2x per week. The Rock combines his chest workout, with a shoulder workout plan, as part of this bi-weekly routine. There’s a lot of synergy between the chest and shoulders. 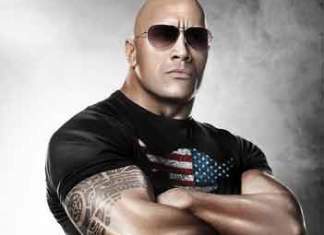 Many of the exercises The Rock does for chest, also work out his shoulder muscles. After Dwayne Johnson finishes his big chest exercises, “The Rock” finishes by focusing on his shoulders. The philosophy behind The Rock workout is to use power moves to work your biggest muscles. Then, you focus on the smaller muscles with more reps and sets. Big muscles require explosive, compound lifts. Smaller muscles need more reps to reach bigger gains. If you’re an advanced lifter, you may consider doing all the sets/reps Dwayne Johnson did at his peak. (The Rock actually did more sets than listed above). See The Rock Workout: How Dwayne Johnson Gets His Pump for more details on his workout. 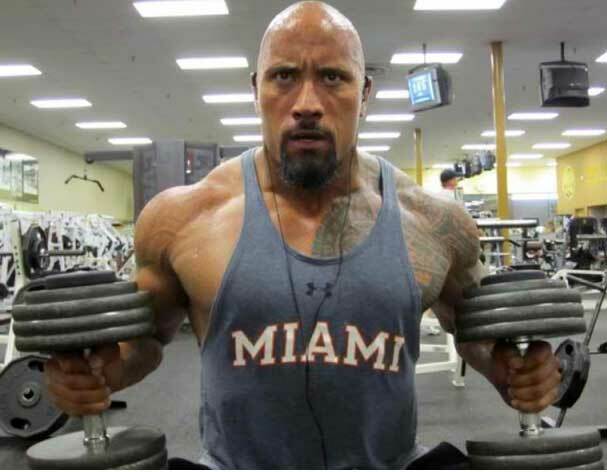 After doing 4 sets, The Rock does an additional 2 more sets. For these sets, he alternates each dumbbell. This allows him to eek out as much lifting power as he can. Still, proper form is advised. Don’t put your back into it, or alter your posture in any negative way. The Rock also uses a Pyramid routine. This is where he goes up in weight each set. Note: The Rock uses dumbbells for a lot of his chest exercises. The illustration includes barbells for a couple exercises, as they’re easier to come by in the gym. If you have access to dumbbells, they’re the way to go. Dumbbells ensure both arms contribute equal strength. Most people are right-handed, thus their right side may be a big stronger. Using dumbbells forces your body to correct any imbalance in strength. Here’s a Link To Download This Printable PDF: Dwayne ‘The Rock’ Johnson Chest Shoulder Workout. The Rock says he sometimes incorporates a Pyramid routine to change up his workout. This is where you start out with high reps and low weight. You go up in weight, and down in reps, each week. In the next month, you reset back to Week 1 of the pyramid routine. Hopefully, you’re able to use a higher amount of weight (as your baseline). Using heavier weight at the start proves you’re making strength gains. Each week you go higher up in weight, while maintaining proper form. The Rock gets all the way to where he only doing six reps at the end of each month. Then, he goes back to the standard reps or increases his baseline (1st week) reps and does another Pyramid routine. Note: This is too many sets for most people. The Rock’s diet is insane. His genetics allow him to lift at an ultra-beast mode level. Unless you’ve been training for a long time, you don’t want to do this much. The Rock’s diet allow him to train with such intensity. Instead, use the sets/reps in the illustration, as shown above. For the last two exercises, you do supersets. This is where you do both exercises without any rest in between. The idea is to fully exhaust your chest & shoulder muscles. Do 12 reps of standing cable flys. Then, immediately do as many bar dips as you can do. Repeat for three total supersets.